Would you like to learn new things and make new friends? Learn about and help look after the animals? Would you like to come and help out on the farm as a Farm Hand at the weekends? We have places available for local (Lawrence Weston, Shirehampton, Seamills and Avonmouth) 8 - 11yr olds who are in need of positive activities. Farm Hands work in a small team with a dedicated member of farm staff to help look after the animals, gardens and woodland and contribute to the community farm in many ways. Places are free and last 6 months. 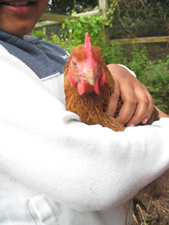 The Farm Hands Project is funded by BBC Children in Need and is aimed at children in need of positive activities. Please contact Kerry 0117 9381128 / kerry@lwfarm.org.uk for more information and an application form.